Chelsey at I'll be seeing you... came up with a cute and fun idea for a new blog meme where each Wednesday she'll pose the question: What's in your ______!? It's already Thursday here but I think I get a free pass since I am in such a far-off time zone... LOL! Making up my own rules already! But since I haven't been posting many bentos lately I have not had anything fun to do on Wednesdays. So I'm grasping at straws here! Cut me a break! 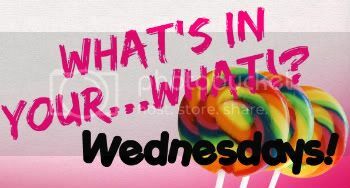 This week Chelsey asks... What's in your... Shower!? I admit I am a bit of a shampoo junkie. I love Aveeno!I really like their hair care products too. It is about the only shampoo that I can use where I don't HAVE to put conditioner in my hair afterward.